During the six-year history of the Prineville Band of Brothers, the local military group has spent the past five participating in veterans' funeral services. 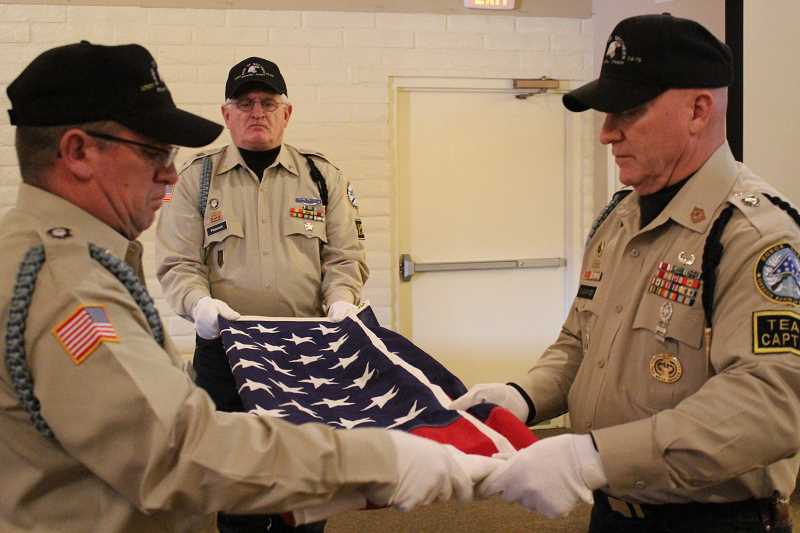 Such services typically involve several special tributes to their military service, including the folding of the American flag, which is presented as a keepsake to family members. The act requires precision and practice to perfect and perform. "It is really precise on how it needs to be done, so it actually comes out in that trifold." explained Dan Swearingen with Band of Brothers. "You have to be precise because you are in a military setting, because it's a military funeral honors detail, and there are protocols that go with that." To learn the proper way to fold the flag and earn credentials to do so in a variety of military funeral situations, Swearingen and 18 other Band of Brothers members completed a training program developed by the Oregon Army National Guard. The Authorized Provider Partnership Program (AP3) is led by Sgt. First Class Brian Tarvin of the National Guard's non-commission officer in charge, Swearingen said. "It's a training program. It is a standardization protocol," he added. According to AP3 guidelines, after Taps is played, the flag is carefully folded in the symbolic tri-cornered shape. A properly proportioned flag will fold 13 times on the triangles, representing the 13 original colonies. When folded, no red or white stripe is to be evident, leaving only the blue field with stars. Swearingen, who currently serves as the team captain for the Band of Brothers' Honor Guard, said that he and the 18 other group members started training one night a week in September 2015. Tarvin came over and gave them instruction as they practiced at Prineville Funeral Home. About seven months later, in April 2016, the group was ready to put their practice to the test. "We went through the certification program with Tarvin," Swearingen recalls. The flag folding is just one of several services the Band of Brothers provides during a funeral service for a military veteran. "We supplement those funerals with a military flag line of all the branches, and we also supplement those services with a rifle team that fires off three volleys. We also have our own bugler." In addition to folding the flag, the local veterans group donates a flag box to the family with an engraved plaque on it as well as three rifle casings that are polished and engraved with "duty, honor and country."